There were a lot of firsts of the season on this week’s episode of The Office. Robert acted somewhat normal, we learned how paper was made, courtesy of Kevin, and the emphasis was finally on a character not named Andy. Although I felt like I was watching more of a drama then a sitcom, the show at least took a small step forward by avoiding some of the irritating dialogue and plot direction I’ve become accustomed to. Ironically, this episode titled “Doomsday,” might just be what the office needed to save the series. The opening didn’t set a good precedent, as I found myself irked early when Andy was impersonating a bartender while singing along to “Closing Time.” Not quite sure if it was intentional or not on the writer’s part, but this was the same character he mimicked in “Michael Scorn,” a Michael Scott production. Instantaneously, my stomach churned as they yet again went the repetitive route. The stomach knots subsided quickly however, as I was pleasantly surprised with Robert’s demeanor throughout the show. Opposed to his usual robotic and creepy self, he resembled a real boss, one with concerns and demands about the mistakes being made in the company. He didn’t convey his message through garbled rhetoric, but simply told Andy what needed to be done. His bluntness actually worked well when blended in with his whacky little tangents about names and iPhones. 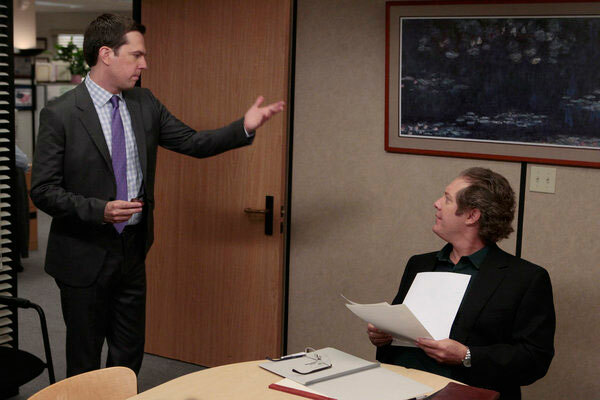 In response to Robert’s critiques, Andy must find ways for the staff to be more efficient—Dwight to the rescue. Dwight convinces Andy to allow him to implement his accountability booster, which will track all mistakes made by anyone in the office. Once the group makes 5 mistakes collectively (according to Dwight, 5 strikes equals a homerun, and you’re out), the software automatically triggers an email alert to Robert (the email alert contains other email forwards of staff talking poorly about Robert). While the staff is focusing less on flawlessness and more on cracking Dwight’s password to deactivate the software, Gabe wanders down into the warehouse to hit on one of the workers. Of course, before doing so, he follows what he believes is HR protocol, and requests that Toby document his new relationship with the woman he has yet to ask out. After many failed attempts to get Dwight to shutdown the software, Pam, Andy, and Kevin take a trip over to Schrute Farms, in hopes of convincing Dwight that sending this email will be detrimental to everyone. Aside from the group assisting Dwight in digging a horse grave, Pam uses a corny joke (pobody’s nerfect) to try and sway Dwight’s decision, which ends up working. The only major flaw in the episode was that they built too much around a few core characters, which eliminated a lot of the quick one-liner outbursts from folks such as Creed, Meredith, Phyllis, and Ryan. Otherwise, the show really showed signs of promise last night. Robert finally seemed to have found his niche, Andy was much more tolerable when the focus wasn’t solely on him, and it was nice to see Dwight return to his roots as the office villain. The producers did a great job of avoiding their fifth strike last night. I love the office a lot I saw this episode today on hulu it was pretty funny but i miss Micheal Scott!!!!! !